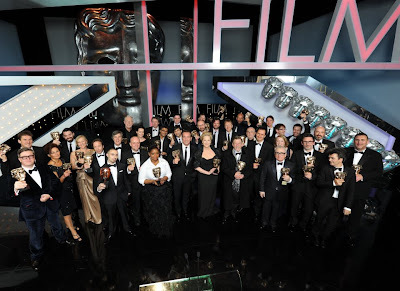 Beyond Infinity Film: 2012 BAFTA Results! So there you go, in total I got 13 correct guesses and 11 wrong; not too bad I guess!? Overall I am happy with these results and winners of the night, and glad to see The Artist (Click here for my review) clean up as the big winner of the night - just as it deserved to. Let's end off with some footage from the night itself, hosted from the Red Carpet by the glamorous Miss Piggy, the star of the fantastic new film The Muppets (Click here for my review) as she flirts and mingles with some of the stars. How well did you do? Did you beat me? Leave your comments below! Beyond Infinity Film is now on Twitter!